Archive for the ‘Concurrency’ Category. The full lineup of speakers at the 2018 LASER summer school on Software for Blockchains, Bitcoin and Distributed Trust is now ready, with the announcement of a new speaker, Primavera De Filippi from CNRS and Harvard on social and legal aspects. The other speakers are Christian Cachin (IBM), Maurice Herlihy (Brown), Christoph Jentzsch (slock.it), me, Emil Gun Sirer (Cornell) and Roger Wattenhofer (ETH). The school is the 14th in the LASER series and takes place June 2-10, 2018, on the island of Elba in Italy. Early-fee registration deadline is February 10. The school’s page is here. Research associates (officially: “Assegno di Ricerca”, with the requirement of having a master degree), which can lead to a PhD position. The requisite degrees as stated above. Innovative and enterprising spirit, passion for quality work in software engineering. Either or both of excellent programming abilities and strong CS theoretical background. Knowledge of as many of possible of: object-oriented programming, concurrency/parallelism, software verification/formal methods, Eiffel. Familiarity with the basics of the project as described in the project pages at the URL above. Much of the progress in robotics is due to software advances, and software issues remain at the heart of the formidable challenges that remain. The 2017 LASER summer school, held in September in Elba, brings together some of the most prestigious international experts in the area. The LASER school has established itself as one of the principal forums to discussed advanced software issues. The 2017 school takes place from 9 to 17 September in the idyllic setting of the Hotel del Golfo in Procchio, Elba Island, Italy. Robotics is progressing at an amazing pace, bringing improvements to almost areas of human activity. Today’s robotics systems rely ever more fundamentally on complex software, raising difficult issues. The LASER 2017 summer school covers both the current state of robotics software technology and open problems. The lecturers are top international experts with both theoretical contributions and major practical achievements in developing robotics systems. Many robotics applications are by nature concurrent; in his ongoing PhD work, Andrey Rusakov  is building a comprehensive concurrent robot programming framework, Roboscoop , based on the SCOOP model for simple concurrent object-oriented programming  and the Ros operating system. As part of this work it is important to know how much robotics applications use concurrency, stay away from concurrency — perhaps because programmers are afraid of the risks — and could benefit from more concurrency. Rusakov has prepared a questionnaire  to help find out. If you have experience in robot programming, please help him by answering the questionnaire, which takes only a few minutes. Simple Concurrent Object-Oriented Programming, see here. The 2016 session of the LASER summer school, now in its 13th edition, has just been announced. The theme is new for the school, and timely: software for robotics. Below is the announcement. The 2016 LASER summer school will be devoted to Software for Robotics. It takes place from 10 to 18 September in the magnificent setting of the Hotel del Golfo in Procchio, Elba Island, Italy. Robotics is progressing at an amazing pace, bringing improvements to almost areas of human activity. Today’s robotics systems rely ever more fundamentally on complex software, raising difficult issues. The LASER 2016 summer school both covers the current state of robotics software technology and open problems. The lecturers are top international experts with both theoretical contributions and major practical achievements in developing robotics systems. Organized by Politecnico di Milano, the school takes place at the magnificent Hotel del Golfo (http://www.hoteldelgolfo.it/) in Golfo di Procchio, Elba. Along with an intensive scientific program, participants will have time to enjoy the natural and cultural riches of this history-laden jewel of the Mediterranean. For more information about the school, the speakers and registration see here. A third ACM webinar this year (after two on agile methods): I will be providing a general introduction to Design by Contract. The date is this coming Thursday, September 17, and the time is noon New York (18 Paris/Zurich, 17 London, 9 Los Angeles, see here for hours elsewhere). Please tune in! The event is free but requires registration here. To verify sequential programs, we have to prove that they do the right thing, but also that they do it within our lifetime — that they terminate. The termination problem is considerably harder with concurrent programs, since they add a new form of non-termination: deadlock. A set of concurrent processes or threads will deadlock if they end up each holding a resource that another wants and wanting a resource that another holds. There is no general solution to the deadlock problem, even a good enough general solution. (“Good enough” is the best we can hope for, since like many important problems deadlock is undecidable.) It is already hard enough to provide run-time deadlock detection, to be able at least to cancel execution when deadlock happens. The research reported in this new paper  pursues the harder goal of static detection. It applies to an object-oriented context (specifically the SCOOP model of concurrent OO computation) and relies fundamentally on the alias calculus, a static alias analysis technique developed in previous publications. The approach is at its inception and considerable work remains to be done. Still, the example handled by the paper is encouraging: analyzing two versions of the dining philosophers problem and proving — manually — that one can deadlock and the other cannot. Bertrand Meyer: An automatic technique for static deadlock prevention, in PSI 2014 (Ershov Informatics Conference), eds. Irina Virbitskaite and Andrei Voronkov, Lecture Notes in Computer Science, Springer, 2015, to appear. ; draft available here. In support of his view of software methodology, Leslie Lamport likes to use the example of non-recursive Quicksort. Independently of the methodological arguments, his version of the algorithm should be better known. In fact, if I were teaching “data structures and algorithms” I would consider introducing it first. As far as I know he has not written down his version in an article, but he has presented it in lectures; see . His trick is to ask the audience to give a non-recursive version of Quicksort, and of course everyone starts trying to remove the recursion, for example by making the stack explicit or looking for invertible functions in calls. But his point is that recursion is not at all fundamental in Quicksort. The recursive version is a specific implementation of a more general idea. a: ARRAY [G -> COMPARABLE] — The array to be sorted. pivot: INTEGER — Set by partition. picked: INTEGER_INTERVAL — Used by the sorting algorithm, see below. ……..……..— or equal to those in pivot+1 .. j. ……..…..create not_sorted.make_one (a.lower |..| a.upper)…. ..……..
……..…..picked := not_sorted.item — Pick an interval from (non-empty) interval set. ……..……..…..partition (picked.lower, picked.upper) — Split, moving small items before & large ones after pivot. ……..……....…not_sorted.extend (pivot + 1 |..| picked.upper) — and second. ……..…...not_sorted.remove (picked) — Remove interval that was just partitioned. Eiffel note: the function yielding an integer interval is declared in the library class INTEGER using the operator |..| (rather than just ..). The query item from SET, with the precondition not is_empty, returns an element of the set. It does not matter which element. In accordance with the Command-Query Separation principle, calling item does not modify the set; to remove the element you have to use the command remove. The command extend adds an element to the set. – The elements of a are a permutation of its original elements. – The index range of any member of slices having more than one element is in not_sorted. – For any adjacent slices s and t (with s before t), s <= t.
The first condition (conservation of the elements modulo permutation) is a property of partition, the only operation that can modify the array. The rest of the invariant is true after initialization (from clause) with slices made of a single slice, the full array. The loop body maintains it since it either removes a one-element interval from not_sorted (slices loses the corresponding slice) or performs partition with the effect of partitioning one slice into two adjacent ones satisfying s <= t, whose intervals replace the original one in not_sorted. On exit, not_sorted is empty, so slices is a set of one-element slices, each less than or equal to the next, ensuring that the array is sorted. The invariant also ensures that the call to partition satisfies that routine’s precondition. ……..……if j > i then — Note that precondition of partition holds. ……..……..…..partition (i, j) — Split into two slices s and t such that s <= t.
……..……..…..sort (i, pivot) — Recursively sort first slice. ……..……..…..sort (pivot+1, j) — Recursively sort second slice. Lampsort, in its author’s view, captures the true idea of Quicksort; the recursive version, and its parallelized variants, are only examples of possible implementations. I wrote at the start that the focus of this article is Lampsort as an algorithm, not issues of methodology. Let me, however, give an idea of the underlying methodological debate. Lamport uses this example to emphasize the difference between algorithms and programs, and to criticize the undue attention being devoted to programming languages. He presents Lampsort in a notation which he considers to be at a higher level than programming languages, and it is for him an algorithm rather than a program. Programs will be specific implementations guided in particular by efficiency considerations. One can derive them from higher-level versions (algorithms) through refinement. A refinement process may in particular remove or restrict non-determinism, present in the above version of Lampsort through the query item (whose only official property is that it returns an element of the set). The example of Lampsort in Eiffel suggests that a good language, equipped with the right abstraction mechanisms, can be effective at describing not only final implementations but also abstract algorithms. It does not hurt, of course, that these abstract descriptions can also be executable, at the possible price of non-optimal performance. The transformation to an optimal version can happen entirely within the same method and language. Quite apart from these discussions of software engineering methodology, Lamport’s elegant version of Quicksort deserves to be known widely. Lamport video here, segment starting at 0:32:34. Carlo Furia, Bertrand Meyer and Sergey Velder: Loop invariants: Analysis, Classification and Examples, in ACM Computing Surveys, September 2014, preliminary text here. The SCOOP concurrency model has a clear division of objects into “regions”, improving the clarity and reliability of concurrent programs by establishing a close correspondence between the object structure and the process structure. Each region has an associated “processor”, which executes operations on the region’s objects. A literal application of this rule implies, however, a severe performance penalty. As part of the work for his PhD thesis (defended two weeks ago), Benjamin Morandi found out that a mechanism for specifying certain processors as “passive” yields a considerable performance improvement. The paper, to be published at COORDINATION, describes the technique and its applications. Benjamin Morandi, Sebastian Nanz and Bertrand Meyer: Safe and Efficient Data Sharing for Message-Passing Concurrency, to appear in proceedings of COORDINATION 2014, 16th International Conference on Coordination Models and Languages, Berlin, 3-6 June 2014, draft available here. 2014 marks the 10-th anniversary (11th edition) of the LASER summer school. The school will be held September 7-14, 2014, and the detailed information is here. LASER (the name means Laboratory for Applied Software Engineering Research) is dedicated to practical software engineering. The roster of speakers since we started is a who’s who of innovators in the field. Some of the flavor of the school can gathered from the three proceedings volumes published in Springer LNCS (more on the way) or simply by browsing the pages of the schools from previous years. Usually we have a theme, but to mark this anniversary we decided to go for speakers first; we do have a title, “Leading-Edge Software Engineering”, but broad enough to encompass a wide variety of a broad range of topics presented by star speakers: Harald Gall, Daniel Jackson, Michael Jackson, Erik Meijer (appearing at LASER for the third time! ), Gail Murphy and Moshe Vardi. With such a cast you can expect to learn something important regardless of your own primary specialty. LASER is unique in its setting: a 5-star hotel in the island paradise of Elba, with outstanding food and countless opportunities for exploring the marvelous land, the beaches, the sea, the geology (since antiquity Elba has been famous for its stones and minerals) and the history, from the Romans to Napoleon, who in the 9 months of his reign changed the island forever. The school is serious stuff (8:30 to 13 and 17 to 20 every day), but with enough time to enjoy the surroundings. As part of our “Concurrency Made Easy” ERC Advanced Investigator Grant project (2012-2017), we are offering PhD positions at the Chair of Software Engineering of ETH Zurich. The goal of the project is to build a sophisticated programming and verification architecture to make concurrent and distributed programming simple and reliable, based on the ideas of Eiffel and particularly the SCOOP concurrency model. Concurrency in its various forms (particularly multithreading) as well as distributed computing are required for most of today’s serious programs, but programming concurrent applications remains a challenge. The CME project is determined to break this complexity barrier. Inevitably, achieving simplicity for users (in this case, application programmers) requires, under the hood, a sophisticated infrastructure, both conceptual (theoretical models) and practical (the implementation). We are building that infrastructure. ETH offers an outstanding research and education environment and competitive salaries for “assistants” (PhD students), who are generally expected in addition to their research to participate in teaching, in particular introductory programming, and other activities of the Chair. The candidates we seek have: a master’s degree in computer science or related field from a recognized institution (as required by ETH); a strong software engineering background, both practical and theoretical, and more generally a strong computer science and mathematical culture; a good knowledge of verification techniques (e.g. Hoare-style, model-checking, abstract interpretation); some background in concurrency or distribution; and a passion for high-quality software development. Prior publications, and experience with Eiffel, are pluses. In line with ETH policy, particular attention will be given to female candidates. Before applying, you should become familiar with our work; see in particular the research pages at se.ethz.ch including the full description of the CME project at cme.ethz.ch. Candidates should send (in PDF or text ) to se-open-positions@lists.inf.ethz.ch a CV and a short cover letter describing their view of the CME project and ideas about their possible contribution. Our Concurrency Made Easy project, the result of an ERC Advanced Investigator Grant, is trying to solve the problem of making concurrent programming simple, reliable and effective. It has spurred related efforts, in particular the Roboscoop project applying concurrency to robotics software. Sebastian Nanz and other members of the CME project at ETH have just produced a video that describes the aims of the project and presents some of the current achievements. The video is available on the CME project page  (also directly on YouTube ). Concurrency Made Easy project, here. The 2013 LASER summer school, organized by our chair at ETH, will take place September 8-14, once more in the idyllic setting of the Hotel del Golfo in Procchio, on the island of Elba in Italy. This is already the 10th conference; the roster of speakers so far reads like a who’s who of software engineering. The theme this year is Software for the Cloud and Big Data and the speakers are Roger Barga from Microsoft, Karin Breitman from EMC, Sebastian Burckhardt from Microsoft, Adrian Cockcroft from Netflix, Carlo Ghezzi from Politecnico di Milano, Anthony Joseph from Berkeley, Pere Mato Vila from CERN and I.
LASER always has a strong practical bent, but this year it is particularly pronounced as you can see from the list of speakers and their affiliations. The topic is particularly timely: exploring the software aspects of game-changing developments currently redefining the IT scene. The LASER formula is by now well-tuned: lectures over seven days (Sunday to Saturday), about five hours in the morning and three in the early evening, by world-class speakers; free time in the afternoon to enjoy the magnificent surroundings; 5-star accommodation and food in the best hotel of Elba, made affordable as we come towards the end of the season (and are valued long-term customers). The group picture below is from last year’s school. Participants are from both industry and academia and have ample opportunities for interaction with the speakers, who typically attend each others’ lectures and engage in in-depth discussions. There is also time for some participant presentations; a free afternoon to discover Elba and brush up on your Napoleonic knowledge; and a boat trip on the final day. Information about the 2013 school can be found here. In modeling object-oriented programs, for purposes of verification (proofs) or merely for a better understanding, we are faced with the unique “general relativity” property of OO programming: all the operations you write (excluding non-OO mechanisms such as static functions) are expressed relative to a “current object” which changes repeatedly during execution. More precisely at the start of a call x.r (…) and for the duration of that call the current object changes to whatever x denotes — but to determine that object we must again interpret x in the context of the previous current object. This raises a challenge for reasoning about programs; for example in a routine the notation f.some_reference, if f is a formal argument, refers to objects in the context of the calling object, and we cannot apply standard rules of substitution as in the non-OO style of handling calls. In earlier work [1, 2] initially motivated by the development of the Alias Calculus, I introduced a notion of negative variable to deal with this issue. 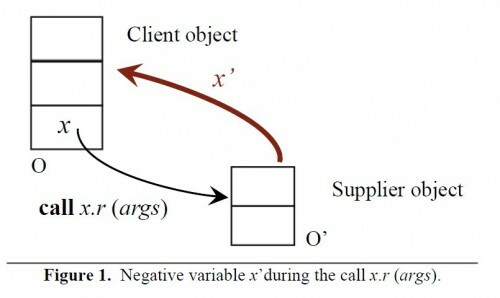 During the execution of a call x.r (…) the negation of x , written x’, represents a back pointer to the calling object; negative variables are characterized by axiomatic properties such as x.x’= Current and x’. (old x)= Current. Alexander Kogtenkov has implemented these ideas and refined them. In a recent paper under submission , we review the concepts and applications of negative variables. Bertrand Meyer: Steps Towards a Theory and Calculus of Aliasing, in International Journal of Software and Informatics, 2011, available here. Bertrand Meyer: Towards a Calculus of Object Programs, in Patterns, Programming and Everything, Judith Bishop Festschrift, eds. Karin Breitman and Nigel Horspool, Springer-Verlag, 2012, pages 91-128, available here. It was perhaps not fully appreciated at the time of [Hoare’s 1969 axiomatic semantics paper] that the roles of pre and post conditions differ in that a pre condition gives permission to a developer to ignore certain possibilities; the onus is on a user to prove that a component will not be initiated in a state that does not satisfy its pre condition. In contrast a post condition is an obligation on the code that is created according to the specification. This Deontic view carries over [to rely-guarantee reasoning]. I use words more proletarian than “deontic”, but this view is exactly what stands behind the concepts of Design by Contract and has been clearly emphasized in all Eiffel literature ever since the first edition of OOSC. It remains, however, misunderstood outside of the Eiffel community; many people confuse Design by Contract with its opposite, defensive programming. The criterion is simple: if you have a precondition to a routine, are you willing entirely to forsake the corresponding checks (conditionals, exceptions…) in the routine body? If not, you may be using the word “contract” as a marketing device, but that’s all. The courage to remove the checks is the true test of adulthood. The application of Microsoft’s “Code Contracts” mechanism to the .NET libraries fails that test: a precondition may say “buffer not full” or “insertions allowed”, but the code still checks the condition and triggers an exception. The excuse I have heard is that one cannot trust those unwashed developers. But the methodological discipline is lost. Now let me repeat this using clearer terminology: it’s not deontic. Cliff Jones: The role of auxiliary variables in the formal development of concurrent programs, in Reflections on the work of C. A. R. Hoare, eds. Jones, Roscoe and Wood, Springer Lecture Notes in Computer Science, 2009, technical report version available here. Springer has just published in the tutorial sub-series of Lecture Notes in Computer Science a new proceedings volume for the LASER summer school . The five chapters are notes from the 2008, 2009 and 2010 schools (a previous volume  covered earlier schools). The themes range over search-based software engineering (Mark Harman and colleagues), replication of software engineering experiments (Natalia Juristo and Omar Gómez), integration of testing and formal analysis (Mauro Pezzè and colleagues), and, in two papers by our ETH group, Is branch coverage a good measure of testing effectiveness (with Yi Wei and Manuel Oriol — answer: not really!) and a formal reference for SCOOP (with Benjamin Morandi and Sebastian Nanz). The idea of these LASER tutorial books — which are now a tradition, with the volume from the 2011 school currently in preparation — is to collect material from the presentations at the summer school, prepared by the lecturers themselves, sometimes in collaboration with some of the participants. Reading them is not quite as fun as attending the school, but it gives an idea. The 2012 school is in full preparation, on the theme of “Advanced Languages for Software Engineering” and with once again an exceptional roster of speakers, or should I say an exceptional roster of exceptional speakers: Guido van Rossum (Python), Ivar Jacobson (from UML to Semat), Simon Peyton-Jones (Haskell), Roberto Ierusalimschy (Lua), Martin Odersky (Scala), Andrei Alexandrescu (C++ and D),Erik Meijer (C# and LINQ), plus me on the design and evolution of Eiffel. The preparation of LASER 2012 is under way, with registration now open ; the school will take place from Sept. 2 to Sept. 8 and, like its predecessors, in the wonderful setting on the island of Elba, off the coast of Tuscany, with a very dense technical program but time for enjoying the beach, the amenities of a 4-star hotel and the many treasures of the island. On the other hand not everyone likes Italy, the sun, the Mediterranean etc. ; that’s fine too, you can wait for the 2013 proceedings. Bertrand Meyer and Martin Nordio (eds): Empirical Software Engineering and Verification, International Summer Schools LASER 2008-2010, Elba Island, Italy, Revised Tutorial Lectures, Springer Verlag, Lecture Notes in Computer Science 7007, Springer-Verlag, 2012, see here. Peter Müller (ed. ): Advanced Lectures on Software Engineering, LASER Summer School 2007-2008, Springer Verlag, Lecture Notes in Computer Science 7007, Springer-Verlag, 2012, see here. LASER summer school information and registration form, http://se.ethz.ch/laser. This is the most sought-after research funding instrument of the EU, with a success rate of about 12% , out of a group already preselected by the host institutions. What makes ERC Advanced Investigator Grants so coveted is the flexibility of the scheme (no constraints on the topic, light administrative baggage) and the trust that an award implies in a particular researcher and his ability to carry out advanced research. The name of the CME project clearly signals its ambition: to turn concurrent programming into a normal, unheroic part of programming. Today adding concurrency to a program, usually in the form of multithreading, is very hard, complexity and risk of all kinds. Everyone is telling us that we must rethink programming, retrain programmers and revamp curricula to put the specific reasoning modes of concurrent programming at the center. I don’t think this can work; thinking concurrently is just too hard to become the default mode. Instead, we should adapt programming languages, theories and tools so that programmers can continue to apply the reasoning schemes that have proved so successful in classical programming, especially object-oriented programming with the benefit of Design by Contract. The starting point is the SCOOP model, to which I started an introduction in an earlier article of this blog , with a sequel yet to come. SCOOP is a minimal extension to the O-O framework to support concurrency, yielding very simple (the S in the acronym) solutions to concurrent programming problems. As part of the CME project we plan to develop it in many different directions and establish a sound and effective formal basis. I have put the project description — the scientific part of the actual proposal text accepted by the ERC — online . In the next few weeks I will be publishing here specific announcements for the positions we are seeking to fill very quickly; they include postdocs, PhD students, and one research engineer. We are looking for candidates with excellent knowledge and practice of concurrency, Eiffel, formal techniques etc. The formal application procedure will be Web-based and is not in place yet but you can contact me if you fit the profile and are interested. We can defeat the curse: concurrent programming (an obligatory condition of any path towards a successful future for information technology) does not have to be black magic. It can be made simple and efficient. Such is the challenge of the CME project. European Research Council: Advanced Grants, available here. European Research Council: Press release on 2011 Advanced Investigator Grants, 24 January 2012, available here. Concurrent Programming is Easy, article from this blog, available here. CME Advanced Investigator Grant project description, available here. and the seminar program is available here. At the start there was Alan. He was the best of all: built the right math model (years ahead of the real thing in any shape, color or form); was able to prove that no one among us can know for sure if his or her loops — or their code as a whole — will ever stop; got to crack the Nazis’ codes; and in so doing kind of saved the world. Once the war was over he got to build his own CPUs, among the very first two or three of any sort. But after the Brits had used him, they hated him, let him down, broke him (for the sole crime that he was too gay for the time or at least for their taste), and soon he died. There was Ed. Once upon a time he was Dutch, but one day he got on a plane and — voilà! — the next day he was a Texan. Yet he never got the twang. The first topic that had put him on the map was the graph (how to find a path, as short as can be, from a start to a sink); he also wrote an Algol tool (the first I think to deal with all of Algol 60), and built an OS made of many a layer, which he named THE in honor of his alma mater . He soon got known for his harsh views, spoke of the GOTO and its users in terms akin to libel, and wrote words, not at all kind, about BASIC and PL/I. All this he aired in the form of his famed “EWD”s, notes that he would xerox and send by post along the globe (there was no Web, no Net and no Email back then) to pals and foes alike. He could be kind, but often he stung. In work whose value will last more, he said that all we must care about is to prove our stuff right; or (to be more close to his own words) to build it so that it is sure to be right, and keep it so from start to end, the proof and the code going hand in hand. One of the keys, for him, was to use as a basis for ifs and loops the idea of a “guard”, which does imply that the very same code can in one case print a value A and in some other case print a value B, under the watch of an angel or a demon; but he said this does not have to be a cause for worry. At about that time there was Wirth, whom some call Nick, and Hoare, whom all call Tony. (“Tony” is short for a list of no less than three long first names, which makes for a good quiz at a party of nerds — can you cite them all from rote?) Nick had a nice coda to Algol, which he named “W”; what came after Algol W was also much noted, but the onset of Unix and hence of C cast some shade over its later life. Tony too did much to help the field grow. Early on, he had shown a good way to sort an array real quick. Later he wrote that for every type of unit there must be an axiom or a rule, which gives it an exact sense and lets you know for sure what will hold after every run of your code. His fame also comes from work (based in part on Ed’s idea of the guard, noted above) on the topic of more than one run at once, a field that is very hot today as the law of Moore nears its end and every maker of chips has moved to a mode where each wafer holds more than one — and often many — cores. Dave (from the US, but then at work under the clime of the North) must not be left out of this list. In a paper pair, both from the same year and both much cited ever since, he told the world that what we say about a piece of code must only be a part, often a very small part, of what we could say if we cared about every trait and every quirk. In other words, we must draw a clear line: on one side, what the rest of the code must know of that one piece; on the other, what it may avoid to know of it, and even not care about. Dave also spent much time to argue that our specs must not rely so much on logic, and more on a form of table. In a later paper, short and sweet, he told us that it may not be so bad that you do not apply full rigor when you chart your road to code, as long as you can “fake” such rigor (his own word) after the fact. Of UML, MDA and other such TLAs, the less be said, the more happy we all fare. A big step came from the cold: not just one Norse but two, Ole-J (Dahl) and Kris, came up with the idea of the class; not just that, but all that makes the basis of what today we call “O-O”. For a long time few would heed their view, but then came Alan (Kay), Adele and their gang at PARC, who tied it all to the mouse and icons and menus and all the other cool stuff that makes up a good GUI. It still took a while, and a lot of hit and miss, but in the end O-O came to rule the world. As to the math basis, it came in part from MIT — think Barb and John — and the idea, known as the ADT (not all TLAs are bad! ), that a data type must be known at a high level, not from the nuts and bolts. There also is a guy with a long first name (he hates it when they call him Bert) but a short last name. I feel a great urge to tell you all that he did, all that he does and all that he will do, but much of it uses long words that would seem hard to fit here; and he is, in any case, far too shy. It is not all about code and we must not fail to note Barry (Boehm), Watts, Vic and all those to whom we owe that the human side (dear to Tom and Tim) also came to light. Barry has a great model that lets you find out, while it is not yet too late, how much your tasks will cost; its name fails me right now, but I think it is all in upper case. At some point the agile guys — Kent (Beck) and so on — came in and said we had got it all wrong: we must work in pairs, set our goals to no more than a week away, stand up for a while at the start of each day (a feat known by the cool name of Scrum), and dump specs in favor of tests. Some of this, to be fair, is very much like what comes out of the less noble part of the male of the cow; but in truth not all of it is bad, and we must not yield to the urge to throw away the baby along with the water of the bath. I could go on (and on, and on); who knows, I might even come back at some point and add to this. On the other hand I take it that by now you got the idea, and even on this last day of the week I have other work to do, so ciao. Al’s Famed Model Of the World, In Words Of Four Signs Or Fewer (not quite the exact title, but very close): find it on line here. The ETH Chair of Software Engineering has won a grant from the Hasler foundation, in a joint project with the Technical University of Lucerne and the Autonomous Systems Lab of ETH, to develop a robotics framework involving concurrent computation. The project, called Roboscoop, will produce a demonstrator system: a “SmartWalker” robot — a robotic version of “walkers” used by elderly people and others with reduced mobility. The research proposal is available . One of the major goals of the Roboscoop framework is to provide robotics applications with the full possibilities of concurrent programming. Many robotics developments use no or little concurrency because of the tricky programming involved in using threads, and the difficulty of getting applications right. With SCOOP  programmers have a simple, high-level mechanism that removes the risk of data races and other plagues of concurrent programming. We are looking for someone with a strong background in both software engineering and robotics. If you are interested, please see the position announcement . On SCOOP see here and here. See also a YouTube video of a small robot programmed with SCOOP as part of an earlier student project (by Ganesh Ramanathan). The IEEE Standard for Requirements Specifications , a short and readable text providing concrete and useful advice, is a valuable guide for anyone writing requirements. In our course projects we always require students to follow its recommended structure. [C] The statement that “the program shall never enter an infinite loop” is nonverifiable because the testing of this quality is theoretically impossible. [F] This statement can be verified because it uses concrete terms and measurable quantities. [A] and [B] are good advice, deserving to be repeated in every software engineering course and to anyone writing requirements. [C], however, is puzzling. One might initially understand that the authors are telling us that it is impossible to devise a finite set of tests guaranteeing that a program terminates. But on closer examination this cannot be what they mean. Such a statement, although correct, would be uninteresting since it can be applied to any functional requirement: if I say “the program shall accept an integer as input and print out that same integer on the output”, I also cannot test that (trivial) requirement finitely since I would have to try all integers. The same observation applies to the example given in [D, E, F]: the property [D] they laud as an example of a “verifiable” requirement is just as impossible to test exhaustively . Since the literal interpretation of [C] is trivial and applies to essentially all possible requirements, whether bad or good in the authors’ eyes, they must mean something else when they cite loop termination as their example of a nonverifiable requirement. The word “theoretically” suggests what they have in mind: the undecidability results of computation theory, specifically the undecidability of the Halting Problem. It is well known that no general mechanism exists to determine whether an arbitrary program, or even just an arbitrary loop, will terminate. This must be what they are referring to. Except, of course, that they are wrong. And a very good thing too that they are wrong, since “The program shall never enter an infinite loop” is a pretty reasonable requirement for any system . If we were to accept [C], we would also accept that it is OK for any program to enter an infinite loop every once in a while, because the authors of its requirements were not permitted to specify otherwise! Fortunately for users of software systems, this particular sentence of the standard is balderdash. there is also no doubt about its termination. More complex examples require the techniques of modern program verification, such as exhibiting a loop variant in the sense of Hoare logic, but they can still be practically tractable. Like many fundamental results of modern science (think of Heisenberg’s uncertainty principle), Turing’s demonstration of the undecidability of the Halting Problem is at the same time simple to state, striking, deep, and easy to misunderstand. It is touchingly refreshing to find such a misunderstanding in an IEEE standard. Do not let it discourage you from applying the excellent advice of the rest of IEEE 830-1998, ; but when you write a program, do make sure — whether or not the requirements specify this property explicitly — that all its loops terminate. IEEE Computer Society: IEEE Recommended Practice for Software Requirements SpeciÞcations, IEEE Standard 830-1998, revised 1998; available here (with subscription). The property [E] is actually more difficult to test, even non-exhaustively, than the authors acknowledge, if only because it is a probabilistic requirement, which can only be tested after one has defined appropriate probabilistic hypotheses. In requesting that all programs must terminate we must of course take note of the special case of systems that are non-terminating by design, such as most embedded systems. Such systems, however, are still made out of components representing individual steps that must terminate. The operating system on your smartphone may need to run forever (or until the next reboot), but the processing of an incoming text message is still, like a traditional program, required to terminate in finite time. It was a bit imprudent last Monday to announce the continuation of the SCOOP discussion for this week; with the TOOLS conference happening now, with many satellite events such as the Eiffel Design Feast of the past week-end and today’s “New Eiffel Technology Community” workshop, there is not enough time for a full article. Next week might also be problematic. The SCOOP series will resume, but in the meantime I will report on other matters. As something that can be conveniently typed in while sitting in the back of the TOOLS room during fascinating presentations, here is a bit of publicity for the next round of one-day seminars for industry — “Compact Course” is the official terminology — that I will be teaching at ETH in Zurich next November (one in October), some of them with colleagues. It’s the most extensive session that we have ever done; you can see the full programs and registration information here. The agile methods course is new; its summary reads almost like a little blog article, so here it is. Agile methods are wonderful. They’ll give you software in no time at all, turn your customers and users into friends, catch bugs before they catch you, change the world, and boost your love life. Do you believe these claims (even excluding the last two)? It’s really difficult to form an informed opinion, since most of the presentations of eXtreme Programming and other agile practices are intended to promote them (and the consultants to whom they provide a living), not to deliver an objective assessment. If you are looking for a guru-style initiation to the agile religion, this is not the course for you. What it does is to describe in detail the corpus of techniques covered by the “agile” umbrella (so that you can apply them effectively to your developments), and assess their contribution to software engineering. It is neither “for” nor “against” agile methods but fundamentally descriptive, pedagogical, objective and practical. The truth is that agile methods include some demonstrably good ideas along with some whose benefits are at best dubious. In addition (and this should not be a surprise) they cannot make the fundamental laws of software engineering go away. Agile methods have now been around for more than a decade, during which many research teams, applying proven methods of experimental science, have performed credible empirical studies of how well the methods really work and how they compare to more traditional software engineering practices. This important body of research results, although not widely known, is critical to managers and developers in industry for deciding whether and how to use agile development. The course surveys these results, emphasizing the ones most directly relevant to practitioners. A short discussion session will enable participants with experience in agile methods to share their results. Taking this course will give you a strong understanding of agile development, and a clear view of when, where and how to apply them. eXtreme Programming, pair programming, Scrum, Test-Driven Development, continuous integration, refactoring, stakeholder involvement, feature-driven development etc. The empirical software engineering literature: review of available studies. Assessment of their value. Principles of empirical software engineering. Agile methods under the scrutiny of empirical research: what helps, what harms, and what has no effect? How do agile methods fare against traditional techniques? Examples: pair programming versus code reviews; tests versus specifications; iterative development versus “Big Upfront Everything”. This final part of the course will present, after a discussion session involving participants with experience in agile methods, a summary of the contribution of agile methods to software engineering. It will conclude with advice for organizations involved in software development and interested in applying agile methods in their own environment. CIOs; software project leaders; software developers; software testers and QA engineers. EiffelStudio 6.8, released last month, contains the first official implementation of the SCOOP programming model for concurrent programming. This is an important milestone; let me try to explain why. Intel: “Multi-core processing is taking the industry on a fast-moving and exciting ride into profoundly new territory. The defining paradigm in computing performance has shifted inexorably from raw clock speed to parallel operations and energy efficiency” . Rick Rashid (head of Microsoft Research): “Multicore processors represent one of the largest technology transitions in the computing industry today, with deep implications for how we develop software.” . Gordon Bell: “I’m skeptical until I see something that gives me some hope… the machines are here and we haven’t got it right.” . What has happened? Concurrency used to be a highly specialized domain of interest to a small minority of programmers building operating systems and networking systems and database engines. Just about everyone else could live comfortably pretending that the world was sequential. And then suddenly we all need to be aware of concurrency. The principal reason is the end of Moore’s law as we know it . This chart show that we can no longer rely on the automatic and regular improvement to our programs’ performance, roughly by a factor of two every two years, thanks to faster chips. The free lunch is over; continued performance increases require taking advantage of concurrency, in particular through multithreading. Performance is not the only reason for getting into concurrency. Another one is user convenience: ever since the first browser showed that one could write an email and load a Web page in the same window, users have been clamoring for multithreaded applications. Yet another source of concurrency requirements is the need to produce Internet and Web applications. How do programmers write these applications? The almost universal answer relies on threading mechanisms, typically offered through some combination of language and library mechanisms: Java Threads, .NET threading, POSIX threads, EiffelThreads. The underlying techniques are semaphores and mutexes: nineteen-sixties vintage concepts, rife with risks of data races (access conflicts to a variable or resource, leading to crashes or incorrect computations) and deadlocks (where the system hangs). These risks are worse than the classical bugs of sequential programs because they are very difficult to detect through testing. Because the need is so critical, the race is on — a “frantic” race in the words of a memorable New York Times article by John Markoff  — to devise a modern programming framework that will bring concurrent programming under control. SCOOP is a contender in this battle. In this post and the next I will try to explain why we think it is exactly what the world needs to tame concurrency. Concurrency calculi such as CSP [6, 7], CCS  and the π-Calculus  define high-level mathematical frameworks addressing concurrency, but they are very far from the practical concerns of programmers. An even more serious problem is that they focus on only some aspects of programming, but being concurrent is only one property of a program, among many others (needing a database, relying on graphical user interface, using certain data structures, perform certain computations…). We need mechanisms that integrate concurrency with all the other mechanisms that a program uses. Functional programming languages have also offered interesting idioms for concurrency, taking advantage of the non-imperative nature of functional programming. Advocacy papers have argued for Haskell [10 and Erlang  in this role. But should the world renounce other advances of modern software engineering, in particular object-oriented programming, for the sake of these mechanisms? Few people are prepared to take that step, and (as I have discussed in a detailed article ) the advantages of functional programming are counter-balanced by the superiority of the object-oriented model in its support for the modular construction of realistic systems. What if we did not have to throw away everything and relearn programming from the ground up for concurrency? What if we could retain the benefits of five decades of software progress, as crystallized in modern object-oriented programming? This is the conjecture behind SCOOP: that we can benefit from all the techniques we have learned to make our software reliable, extendible and reusable, and add concurrency to the picture in an incremental way. -- Transfer amount dollars from source to target. The caller must satisfy the precondition, requiring the source account to have enough money to withdraw the requested amount; the postcondition states that the source account will then be debited, and the target account credited, by that amount. If the original balance on acc1 is 100, it would be perfectly possible in the absence of a proper concurrency mechanism that both calls, as they reach the test acc1·balance >= 100, find the property to be true and proceed to do the transfer — but incorrectly since they cannot both happen without bringing the balance of acc1 below zero, a situation that the precondition of transfer and the tests were precisely designed to rule out. This is the classic data race. To avoid it in the traditional approaches, you need complicated and error-prone applications of semaphores or conditional critical regions (the latter with their “wait-and-signal” mechanism, just as clumsy and low-level as the operations on semaphores). -- The rest of the routine exactly as before. Every call to transfer is guaranteed exclusive access to both separate arguments (the two accounts). This simultaneous reservation of multiple objects (a particularly tricky task when programmers must take care of it through their own programs, as they must in traditional approaches) is automatically guaranteed by the SCOOP scheduler. The calls wait as needed. As a consequence, the conditional instructions (if … then… ) are no longer needed. Just call transfer and rely on SCOOP to do the synchronization and guarantee correctness. As part of this correctness guarantee, the calls may have to wait until the preconditions hold, in other words until there is enough money on the account. This is the desired behavior in the transition from sequential to concurrent. It is achieved here not by peppering the code with low-level concurrent operations, not by moving to a completely different programming scheme, but by simply declaring which objects are “separate” (potentially running elsewhere. The idea of SCOOP is indeed that we reuse all that we have come to enjoy in modern object-oriented programming, and simply declare what needs to be parallel, expecting things to work (“principle of least surprise”). This is not how most of the world sees concurrency. It’s supposed to be hard. Indeed it is; very hard, in fact. But the view of the people who built SCOOP is that as much of the difficulty should be for the implementers. Hence the title of this article: for programmers, concurrency should be easy. And we think SCOOP demonstrates that it can be. A few words of caution: we are not saying that SCOOP as provided in EiffelStudio 6.8 is the last word. (Otherwise it would be called 7.0.) In fact, precisely because implementation is very hard, a number of details are still not properly handled; for example, as discussed in recent exchanges on the EiffelStudio user group , just printing out the contents of a separate string is non-trivial. We are working to provide all the machinery that will make everything work well, the ambitious goals and the practical details. But the basics of the mechanism are there, with a solid implementation designed to scale properly for large applications and in distributed settings. In next week’s article I will describe in a bit more detail what makes up the SCOOP mechanisms. To get a preview, you are welcome to look at the documentation [14, 15]; I hope it will convince you that despite what everyone else says concurrent programming can be easy. Official Intel statement, see e.g. here. Rich Rashid, Microsoft Faculty Summit, 2008. This statement was cited at the Microsoft Faculty Summit in 2008 and is part of the official transcript; hence it can be assumed to be authentic, although I do not know the original source. Patterson and Bell citations from John Markoff, Faster Chips Are Leaving Programmers in Their Dust, New York Times, 17 December 2007, available here. The chart is from the course material of Tryggve Fossum at the LASER summer school in 2008. C.A.R. Hoare: em>Communicating Sequential Processes, Prentice Hall, 1985, also available online. Bill Roscoe: The Theory and Practice of Concurrency, revised edition, Prentice Hall, 2005, also available online. Robin Milner: Communication and Concurrency, Prentice Hall, 1989. Robin Milner: Communicating and Mobile Systems: The π-calculus, Cambridge University Press, 1999. Simon Peyton-Jones: Beautiful Concurrency, in Beautiful Code, ed. Greg Wilson, O’Reilly, 2007, also available online. Joe Armstrong: Erlang, in Communications of the ACM, vol. 53, no. 9, September 2010, pages 68-75. Bertrand Meyer: Software Architecture: Functional vs. Object-Oriented Design, in Beautiful Architecture, eds. Diomidis Spinellis and Georgios Gousios, O’Reilly, 2009, pages 315-348, available online. EiffelStudio user group; see here for a link to current discussions and to join the group. SCOOP project documentation at ETH, available here. Professor Smith Risk 1: possible bias if the evaluator has a stake in the ideas or tools under assessment. Professor Smith Risk 2: creating different levels of motivation in the different groups (Hawthorne effect). Professor Smith Risk 3: extrapolating from students to professionals. Professor Smith Risk 4: violation of educational ethics if the experiment may cause some students to learn better than others. If you have developed a great new method or tool and would like to assess it, the best way to address Risk 1 is to find someone else to do the assessment. What if this solution is not practical? Recently we wanted to get some empirical evidence on the merits of the SCOOP (Simple Concurrent Object-Oriented Programming) approach to concurrency [1, 2], on which I have worked for a long time and which is now part of EiffelStudio since the release of 6.8 a couple of weeks ago. We wanted to see if, despite the Professor Smith risks, we could do a credible study ourselves. The ETH Software Architecture course, into which we introduced some introductory material on concurrency last year (as part of a general effort to push more concurrency into software courses at ETH), looked like a good place to try an evaluation; it is a second-year course, where students, or so we thought, would have little prior experience in concurrent software design. The study’s authors — Sebastian Nanz, Faraz Torshizi and Michela Pedroni — paid special attention to the methodological issues. To judge for yourself whether we addressed them properly, you can read the current version of our paper to be presented at ESEM 2011 . Do note that it is a draft and that we will improve the paper for final publication. Here is some of what we did. I will not address the Professor Smith Risk 3, the use of students, which (as Lionel Briand has pointed out in a comment on the previous article) published work has studied; in a later article I will give references to some of that work. But we were determined to tackle the other risks explicitly, so as to obtain credible results. The basic experiment was a session in which the students were exposed to two different design methods for concurrent software: multithreaded programming in Java, which I’ll call “Java Threads”, and SCOOP. We wanted to explore whether it is easier to program in SCOOP than in Java. This is too general a hypothesis, so it was refined into three concrete hypotheses: is it easier to understand a SCOOP program? Is it easier to find errors in SCOOP programs? Do programmers using SCOOP make fewer errors? A first step towards reducing the effect — Professor Smith Risk 1 — of any emotional attachment of the experimenters to one of the approaches, SCOOP in our case, was to generalize the study. Although what directly interested us was to compare SCOOP against Java Threads, we designed the study as a general scheme to compare concurrency approaches; SCOOP and Java Threads are just an illustration, but anyone else interested in assessing concurrency techniques — say Erlang versus C# concurrency — can apply the same methodology. This decision had two benefits: it freed the study from dependency on the particular techniques, hence, we hope, reducing bias; and as side attraction of the kind that is hard for researchers to resist, it increased the publishability of the results. Circumstances unexpectedly afforded us another protection against any for-SCOOP bias: unbeknownst to us at the time of the study’s design, a first-year course had newly added (in 2009, whereas our study was performed in 2010) an introduction to concurrent programming — using Java Threads! While we had thought that concurrency in any form would be new to most students, in fact almost all of them had now seen Java Threads before. (The new material in the first-year course was taken by ETH students only, but many transfer students had also already had an exposure to Java Threads.) On the other hand, students had not had any prior introduction to SCOOP. So any advantage that one of the approaches may have had because of students’ prior experience would work against our hypotheses. This unexpected development would not help if the study’s results heavily favored Java Threads, but if they favored SCOOP it would reinforce their credibility. A particular pedagogical decision was made regarding the teaching of our concurrency material: it started with a self-study rather than a traditional lecture. One of the reasons for this decision was purely pedagogical: we felt (and the course evaluations confirmed) that at that stage of the semester the students would enjoy a break in the rhythm of the course. But another reason was to avoid any bias that might have arisen from any difference in the lecturers’ levels of enthusiasm and effectiveness in teaching the two approaches. In the first course session devoted to concurrency, students were handed study materials presenting Java Threads and SCOOP and containing a test to be taken; the study’s results are entirely based on their answers to these tests. The second session was a traditional lecture presenting both approaches again and comparing them. The purpose of this lecture was to make sure the students got the full picture with the benefit of a teacher’s verbal explanations. The study material was written carefully and with a tone as descriptive and neutral as possible. To make comparisons meaningful, it does not follow a structure specific to Java Threads or SCOOP (as we might have used had we taught only one of these approaches); instead it relies in both cases on the same overall plan (figure 2 of the paper), based on a neutral analysis of concurrency concepts and issues: threads, mutual exclusion, deadlock etc. Each section then presents, for one such general concurrency question, the solution proposed by Java Threads or SCOOP. This self-study material, as well as everything else about the study, is freely available on the Web; see the paper for the links. In the self-study, all students studied both the Java Threads and SCOOP materials. They were randomly assigned to two groups, for which the only difference was the order of studying the approaches. We feel that this decision addresses the ethical issue (Professor Smith Risk 4): any pedagogical effect of reading about A before B rather than the reverse, in the course of a few hours, has to be minimal if you end up reading about the two of them, and on the next day follow a lecture that also covers both. Having all students study both approaches — a crossover approach in the terminology of  — should also address the Hawthorne effect (Professor Smith Risk 2): students have no particular incentive to feel that one of the approaches is more hip than the other. While they are not told that SCOOP is partly the work of the instructors, some of them may know or guess this information; the consequences, positive or negative, are limited, since they are asked in both cases to do as well as they can in answering the assessment questions. The design of that evaluation is another crucial element in trying to avoid bias. We tried, to the extent possible, to base the assessment on objective criteria. For the first hypothesis (program understanding) the technique was to ask the students to predict the output of some simple concurrent programs. To address the risk of a binary correct/incorrect assessment, and get a more fine-grained view, we devised the programs so that they would produce output strings and measured the Levenshtein (edit) distance to the correct result. For the second hypothesis (ease of program debugging), we gave students programs exhibiting typical errors in both approaches and asked them to tell us both the line number of any error they found and an explanation. Assessing the explanation required human analysis; the idea of also assigning partial credit for pointing out a line number without providing a good explanation is that it may be meaningful that a student found that something is amiss even without being quite able to define what it is. The procedure for the third hypothesis (producing programs with fewer errors) was more complex and required two passes over the result; it requires some human analysis, as you will see in the article, but we hope that the two-pass process removes any bias. This description of the study is only partial and you should read the article  for the full details of the procedure. So what did we find in the end? Does SCOOP really makes concurrency easier to learn, concurrent programs easier to debug, and concurrent programmers less error-prone? Here too I will refer you to the article. Let me simply mention that the results held some surprises. In obtaining these results we tried very hard to address the Professor Smith syndrome and its four risks. Since all of our materials, procedures and data are publicly accessible, described in some detail in the paper, you can determine for yourself how well we met this objective, and whether it is possible to perform credible assessments even of one’s own work. Further reading: for general guidelines on how to conduct empirical research see ; for ethical guidelines, applied to psychological research but generalizable, see . SCOOP Eiffel documentation, available here. Software Architecture course at ETH, course page (2011). Sebastian Nanz, Faraz Torshizi, Michela Pedroni and Bertrand Meyer: Design of an Empirical Study for Comparing the Usability of Concurrent Programming Languages, to appear in ESEM 2011 (ACM/IEEE International Symposium on Empirical Software Engineering and Measurement), 22-23 September 2011. Draft available here. Barbara A. Kitchenham, Shari L. Pfleeger, Lesley M. Pickard, Peter W. Jones, David C. Hoaglin, Khaled El-Emam and Jarrett Rosenberg: Preliminary Guidelines for Empirical Research in Software Engineering, national Research Council Canada (NRC-CNRC), Report ERB-1082, 2001, available here. Robert Rosenthal: Science and ethics in conducting, analyzing, and reporting psychological research, in Psychological Science, 5, 1994, p127-134. I found a copy cached by a search engine here. The symposium is over two days. It is followed by a special event on “Eiffel at 25” which, as the rest of FOSE, is resolutely forward-looking, presenting a number of talks on current Eiffel developments, particularly in the areas of verification integrated in the development cycle (see “Verification As A Matter Of Course” ) and concurrent programming. Future Of Software Engineering (FOSE): symposium home page. Broy and Denert, editors: Software Pioneers, Springer, 2002. See publisher’s page. Verification As a Matter Of Course (VAMOC): an earlier entry of this blog. I am blogging live from the “Cloud Futures” conference organized by Microsoft in Redmond . We had two excellent keynotes today, by Ed Lazowska  and David Patterson. Lazowska emphasized the emergence of a new kind of science — eScience — based on analysis of enormous amounts of data. His key point was that this approach is a radical departure from “computational science” as we know it, based mostly on large simulations. With the eScience paradigm, the challenge is to handle the zillions of bytes of data that are available, often through continuous streams, in such fields as astronomy, oceanography or biology. It is unthinkable in his view to process such data through super-computing architectures specific to an institution; the Cloud is the only solution. One of the reasons (developed more explicitly in Patterson’s talk) is that cloud computing supports scaling down as well as scaling up. If your site experiences sudden bursts of popularity — say you get slashdotted — followed by downturns, you just cannot size the hardware right. 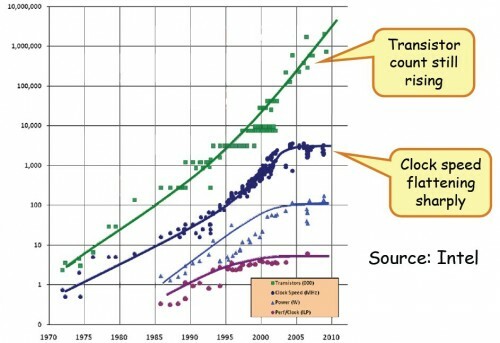 Lazowska also noted that it is impossible to convince your average university president that Cloud is the way to go, as he will get his advice from the science-by-simulation types. I don’t know who the president is at U. of Washington, but I wonder if the comment would apply to Stanford? The overall argument for cloud computing is compelling. Of course the history of IT is a succession of swings of the pendulum between centralization and delocalization: mainframes, minis, PCs, client-server, “thin clients”, “The Network Is The Computer” (Sun’s slogan in the late eighties), smart clients, Web services and so on. But this latest swing seems destined to define much of the direction of computing for a while. Interestingly, no speaker so far has addressed issues of how to program reliably for the cloud, even though cloud computing seems only to add orders of magnitude to the classical opportunities for messing up. Eiffel and contracts have a major role to play here. More generally the opportunity to improve quality should not be lost. There is a widespread feeling (I don’t know of any systematic studies) that a non-negligible share of results generated by computational science are just bogus, the product of old Fortran programs built by generations of graduate students with little understanding of software principles. At the very least, moving to cloud computing should encourage the use of 21-th century tools, languages and methods. Availability on the cloud should also enhance a critical property of good scientific research: reproducibility. Software engineering is remarkably absent from the list of scientific application areas that speaker after speaker listed for cloud computing. Maybe software engineering researchers are timid, and do not think of themselves as deserving large computing resources; consider, however, all the potential applications, for example in program verification and empirical software engineering. The cloud is a big part of our own research in verification; in particular the automated testing paradigm pioneered by AutoTest  fits ideally with the cloud and we are actively working in this direction. Lazowska mentioned that development environments are the ultimate application of cloud computing. Martin Nordio at ETH has developed, with the help of Le Minh Duc, a Master’s student at Hanoi University of Technology, a cloud-based version of EiffelStudio: CloudStudio, which I will present in my talk at the conference tomorrow. I’ll write more about it in later posts; just one note for the moment: no one should ever be forced again to update or commit. Program of the Cloud Futures conference. Keynote by Ed Lazowska. You can see his slides here. Bertrand Meyer, Arno Fiva, Ilinca Ciupa, Andreas Leitner, Yi Wei, Emmanuel Stapf: Programs That Test Themselves. IEEE Computer, vol. 42, no. 9, pages 46-55, September 2009; online version here. At the ACM Symposium on Applied Computing (SAC) in Sierre last week, I gave a talk entitled “How you will be programming in 10 years”, describing a number of efforts by various people, with a special emphasis on our work at both ETH and Eiffel Software, which I think point to the future of software development. Several people have asked me for the slides, so I am making them available . It occurred to me after the talk that the slogan “Verification As a Matter Of Course” (VAMOC) characterizes the general idea well. The world needs verified software, but the software development community is reluctant to use traditional heavy-duty verification techniques. While some of the excuses are unacceptable, others sources of resistance are justified and it is our job to make verification part of the very fabric of everyday software development. My bet, and the basis of large part of both Eiffel and the ETH verification work, is that it is possible to bring verification to practicing developers as a natural, unobtrusive component of the software development process, through the tools they use. The talk also broaches on concurrency, where many of the same ideas apply; CAMOC is the obvious next slogan. Slides of “How you will be programming in 10 years” talk (PDF).